No permit is required from the Bangko Sentral ng Pilipinas to bring in to or to take out from the Philippines of foreign currencies. However foreign currency in excess of US$10000 carried by the traveler must be declared at the Bureau of Customs Desk in the airport. This is pursuant to the Anti-Money Laundering Act of 2001 which requires all money transactions involving amounts in excess of PhP400000 to be reported to the Anti-Money Laundering Council (even if the transaction is done through the banks). Travelers arriving in the Philippines must submit to the Bureau of Customs Desk in the airport Arrival Area a Declaration Form stating the amount (foreign currency in excess of $10000.00) being brought in. The source of the money (e.g. personal income) must be stated. Travelers departing the Philippines must submit to the Bureau of Customs Desk in the airport Departure Area a Declaration Form stating the amount (foreign currency in excess of $10000.00) to be brought in or taken out of the Philippines. The source of the money (e.g. personal income) must be stated. 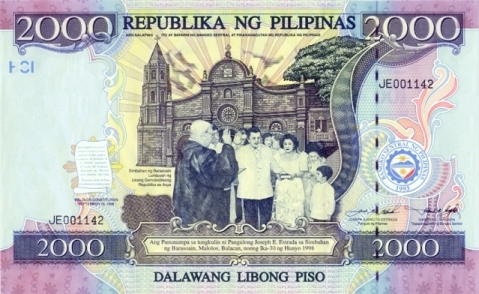 The taking in and bringing out of Philippines of Philippine currency in excess of PhP10000 is strictly prohibited and any need carry any currency in excess of the said amount must be given authorization by the Bangko Sentral ng Pilipinas (BSP) Cash Division. Notice that while you can bring in or take out all the foreign currency you want you can only bring in or take out 10000 Philippine Pesos. I am brining a cashier’s check for $21,000 . Should this is also be declared together with the US dollar bills? Will be taxed for declaring the excess of $10,000? If your money exceeds are you going to pay for that ?